Ten journalists from Asia Pacific countries explored mobile journalism techniques (MOJO) for accessing news sources in remote communities as part of a five-week AusAID supported program on economic reporting. Participants included journalists from Papua province and West Timor in Indonesia, Papua New Guinea and Timor-Leste. 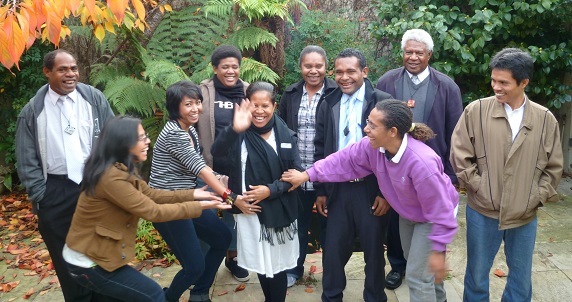 The program was funded by AusAID as part of its Australian Leadership Awards. The program was aimed at helping editors and journalists in the Asia Pacific region report the business and economic life of their communities more effectively. The program consisted of a one-week leadership workshop, a two-week master class on Reporting the Economic Life of Communities, news media attachments and professional visits to business, media and other institutions in Melbourne, Canberra and Sydney. Fellows attended the delivery of the 2011 Australian Federal Budget and briefings at Asian Development Bank, Australian Consumer Association, Canberra Times, Reserve Bank, International Federation of Journalists, Media Entertainment and Arts Alliance (journalists union), National Museum, Reconciliation Australia and World Bank. Speakers at the master class included representatives of ABC Radio Australia, The Age business section, Climate Group, Eureka Report, Business Spectator and Leader Newspapers.